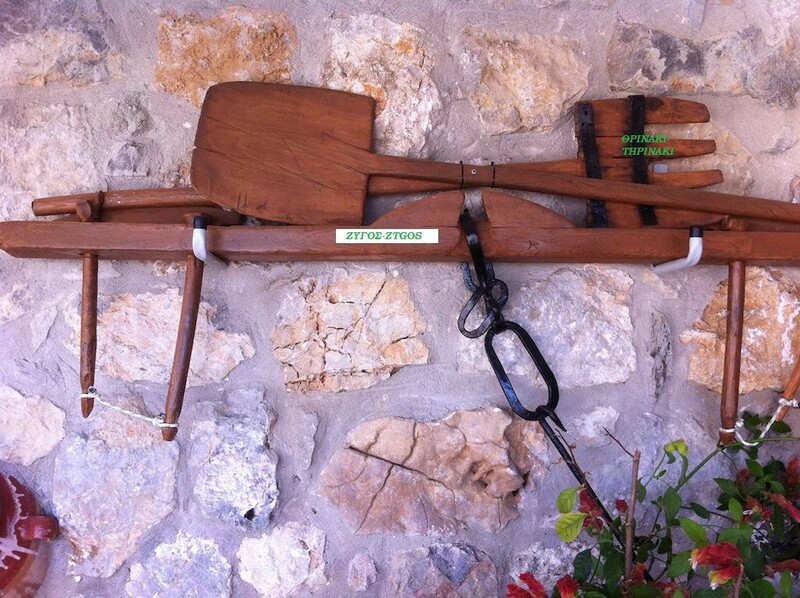 In the coffehouse, you have the chance to see some traditional household and agricultural use tools that our ancestors bequaithed us. They teach the indomitable will to survive, as well as an inspiration for new creations, but also that today and yesterday are not connected with airlifts. There is a continouty. They also have educational value as acquired knowledge – the foundation for new spiritual experiences and creations. Finally,they are an invaluable spiritual treasure. A lamp working with oil and cotton. Instrument which measures the weight of a body. It was a chipped wood, elongated, which had placed metal blades to break into pieces the grain. The chipped wood connected with the zygos and pulled the animals all around the threshing floor to separate the seed from the chaff. 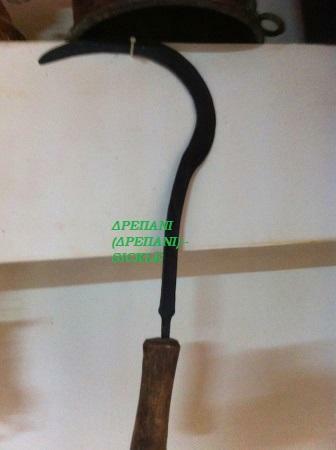 Special shovel with wooden teeth, to gather a bunch of the ear that was spread out on the threshing floor, but do not destroy the bottom of the threshing floor, which was earthen-level to gather from this grain. 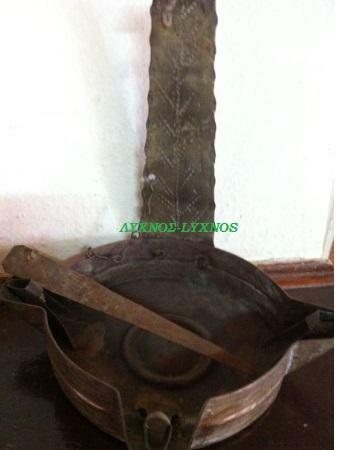 The Tsoukos was the product of a plant, currently in use as decorative. Previously, a hole is drilled, cleaned spores had the plant to disperse and reproducing. 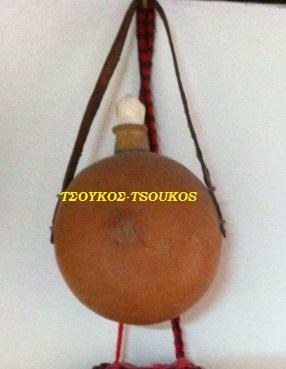 Used for wine or raki. There are various sizes. 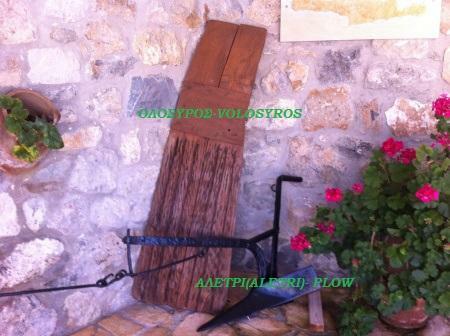 Is agricultural tool for harvesting grain and grass, invented since ancient times. Old irons clothes were made ​of thick metal. The handle was made ​of wood not to burn your hands that you used it. It was divided into two parts . The bottom was concave where they entered through the coals and the top was thin and used as a cap for closing the iron. 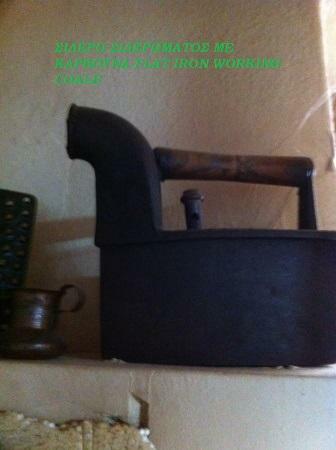 The oxygen permeated through the holes existing in the iron. The rotary handmill was the first of all grist mill, but we do not have clear information about its chronology . 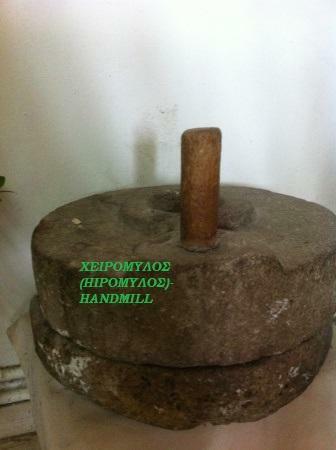 The process of grinding involved in a hand mill grinding between a pair of round, flamillstones. The whole movement was repeated, with the operator to cast with an arm wrist through a narrow opening in the upper stone, waving with the other hand circularly another by means of a vertical ,wooden handle that was built there. These two surfaces allow the grain to pass again and again until there between become finally product. 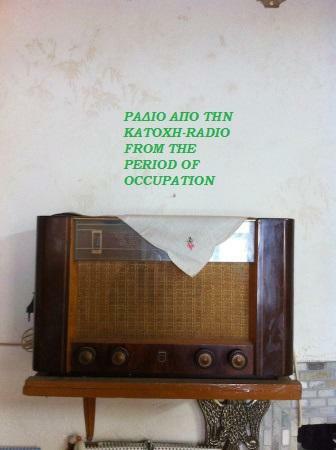 This is a radio with great sentimental and historical value. It was the only one in the village. Gathered here to drink coffee, play cards (prefa) and hear the news. The mortar is a cooking utensil which is used, in addition to the mortar or otherwise Maul, crushing, grinding and slurrying solids. Round utensil with a wooden frame and usually flat metal perforated bottom, which holds a material in granular or powder foreign bodies or larger than normal grain. 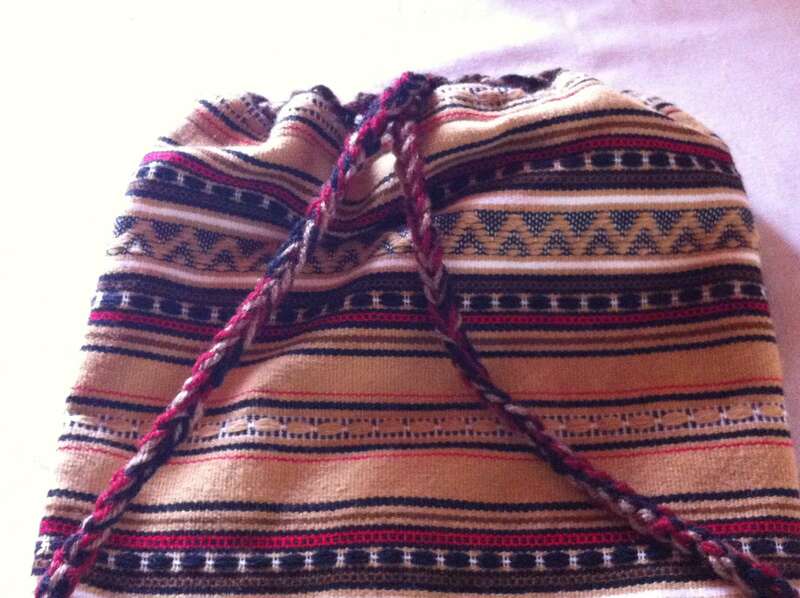 Handmade, woven, woolen “bag” necessary in everyday life of the Cretans, for many different uses. 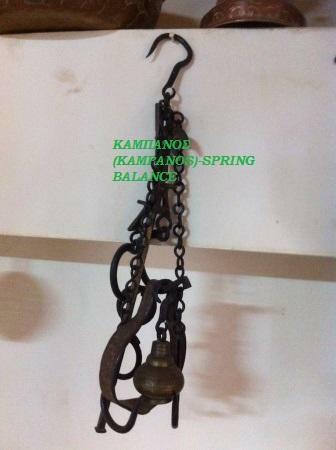 Formerly the warriors used to put their bullets and guns, while in recent years the farmers used them to put their food and flask with wine or water.  Εven the great Cretan thinker and writer Nikos Kazantzakis used it to keep his manuscripts. Best vourgiali, with a silk scarf, was the first gift to the groom when was engaged. Plus the vourgiali used at weddings to put into the “gifts” that make the guests to the couple, and as a souvenir to the visitors of our island. The decoration covers the whole vourgiali. You will find it in various sizes and colours. 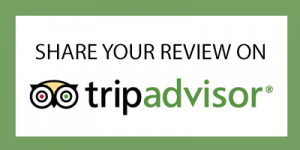 It is also used as a very nice decorative.